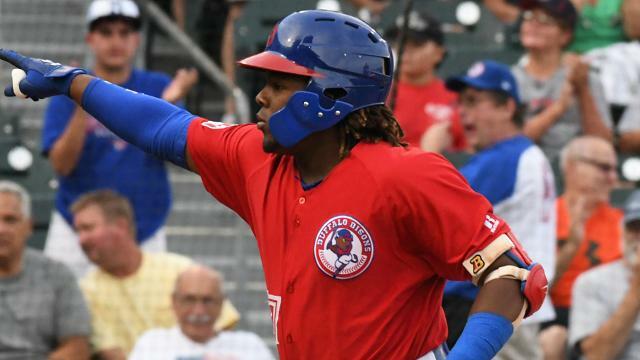 Baseball America has announced that they have named Buffalo Bisons 3B Vladimir Guerrero Jr. their 'Minor League Player of the Year.' He is the first Bisons player to ever receive the honor and just the second Blue Jays player to win the award, joining Derek Bell in 1991. Guerrero Jr. played his final 30 games of the 2018 season with the Bisons, having been promoted to the team from Double-A New Hampshire on July 31. In his time with the Herd, baseball's top prospect hit .336 with seven doubles, six home runs, 16 RBI and a .978 OPS. He walked 15 times to only 10 strikeouts at Triple-A and hit an impressive .397 with five of his six home runs in 16 games at Coca-Cola Field. He homered in four consecutive games with the Herd, August 8-11, for which he was named International League Batter of the Week. Guerrero Jr. began the season with New Hampshire and was the Eastern League Player of the Month in May. In his 95 total minor league games this year, Vladdy hit .381 with 29 doubles, 20 home runs, 78 RBI and 67 runs scored. He posted a .437 on-base pct. and a .636 slugging pct. for a combined 1.073 OPS.